Super Saiyan Gogeta makes his debut in SPARKING rarity! 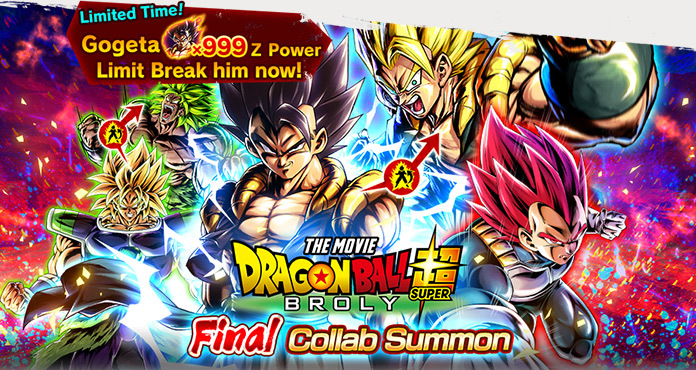 "Dragon Ball Super: Broly" Final Collab Summon is on now! Super Special! "Dragon Ball Super: Broly" Final Collab Summon: Z Power x999 Summon on now! Limited Time! A Special Summon where the New Character can be summoned with Z Power x999! Perfect Chance for Limit Breaks! *This Summon event only affects the Summon labelled with the logo "Z Power x999 Limit Break him now!" on the Summon screen. Please restart the app if this Summon does not appear after its scheduled start time.